Inner-city London: for hundreds of years the multi-cultural melting pot of communities from around the globe. It should hardly come as a surprise that English isn't always the dominant language, yet for certain sections of the media it appears to. According to a study by the Department for Children, Schools and Families, 54% of primary school pupils don't have English as a first language, providing ample opportunities for headlines which include the words 'fury', 'swamped' and 'over-run'. Tsk. They come over here, not taking our houses and then can't even speak the lingo. Needless to say, the implication is that British children are being disadvantaged in favour of classmates who need extra help with English language, though a DCSF spokesman says the statistics don't take into account fluency of English outside of home and in fact it's a small number recent arrivals who need the most assistance. But whoever let common sense and an understanding of statistics get in the way of a good whinge about how immigration is destroying the country? 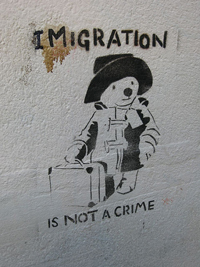 Grabbing an opportunity to leap into the fray, Sir Andrew Green of Migrationwatch said: 'These figures confirm the huge impact immigration is having on our society,' before adding somewhat ingenuously, 'in inner London it's hard to know who immigrant children are supposed to integrate with since they heavily outnumber local children.' We hadn't realised there were rules around who integrates with whom and thought they might just 'integrate' without instruction as children tend to, but what do we know? Image by Louise Ferguson used under Creative Commons license.